Sept 14 2010: As my wife slept, I got out before sunrise and explored Venice with my D3s. It was one of those days you remember as a photographer because it's a target rich environment. I knew the kinds of compositions I wanted to photograph, I just had to find them. One of those images was a photo of the Campaniel of St. Mark's Square and it's reflection. As I neared the Square I had to cross these small pedestrian bridges. This particular bridge was perfect and there were no other "tourists" to shake the small bridge as they walked over this canal. I set up my travel tripod and clicked the photo. Sometimes God puts you in the right spot at the right time, and all you have to do is press the shutter. What a great find to have the campanile so perfectly framed in this way. Thanks so much for taking the time to look at some of my other seasonal decoration photos and leave thoughtful comments. Definitely much appreciated. Fabulous composition & such beautiful reflections! Awesome comp, colors and reflections! I love colors and reflections and they both make this a remarkable photo well worth arising early! 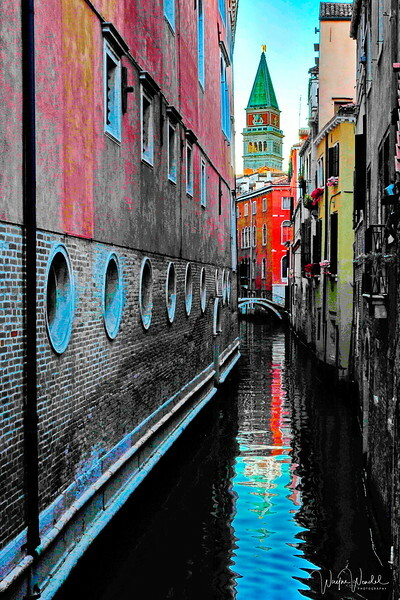 What a wonderful shot of this canal. I love the colors and the leading lines that draw the eye very deep into the scene. Well done. Wonderful POV and nothing like those early morning for the great light and lack of tourists!